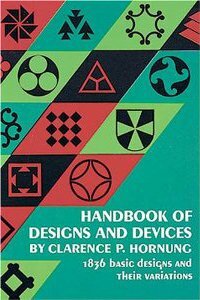 If you’re intrigued by patterns, ornament and design and their variations, Clarence P. Hornung’s Handbook of Designs and Devices , “by one of America’s foremost industrial and graphic designers” is a wonderful reference to have on your bookshelf. Though originally published in 1932 by Harper Brothers, it has been revised and updated since and its contents are still contemporary. There isn’t a great deal of text apart from the Introduction and the “Notes on Plates”. Though you may find the writing style a bit old fashioned, I find it charming and more importantly, very informative. If you are a student of design or simply wish to have a handy resource of ideas to enhance your Zentangle creativity, I highly recommend Clarence Hornung’s Handbook of Designs and Devices .